16-inch gun M1919 on barbette mount M1919, Fort Duvall, Boston, Massachusetts. The first US 16-inch (406 mm) gun started construction in 1895 at Watervliet Arsenal. It was known as the M1895 and completed in 1902; only one was built. It was mounted on a disappearing carriage in Fort Grant on the Pacific side of the Panama Canal Zone in 1914, where it served until scrapped in 1943. The weapon's muzzle section was displayed at the Watervliet Arsenal museum, which closed in 2013. 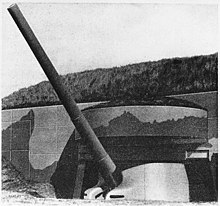 16 in Mark III coastal defense gun on a proof mount at Aberdeen Proving Ground, Maryland. The second 16-inch (406 mm) gun was the United States Army 50 caliber Model 1919 (M1919). The first of these was deployed to Fort Michie, Great Gull Island, New York on a unique all-around-fire M1917 disappearing carriage, with elevation increased from 15° to 30°. An additional six of the Army-designed M1919 guns were built and deployed by 1927 in two-gun batteries on barbette carriages in the harbor defenses of Boston (Fort Duvall), New York City (Fort Tilden), and Pearl Harbor, Hawaii (Fort Weaver). The 16-inch gun M1919 was built using the wire-wound method, common in Europe but rare in the United States. Based on the Coast Artillery's experience operating heavy weapons in World War I, especially the French-made 400 mm (15.75 inch) Modèle 1916 railway howitzer, the M1919 barbette carriage was designed with an elevation of 65° to allow plunging fire as enemy ships approached. In 1922, the terms of the Washington Naval Treaty caused the US Navy to cancel the South Dakota-class battleships and the Lexington-class battlecruisers, surplusing 16-inch/50 caliber Mark II and Mark III barrels. Initially, 20 guns were transferred to the Army, which built a new version of the M1919 mount for the naval guns. With funding lacking until 1940, five batteries of two guns each were built 1924-40 in the harbor defenses of Pearl Harbor, Panama (Pacific side), and San Francisco. In 1940 a near-fiasco was experienced in designing the Iowa-class battleships, and a new gun, the 16"/50 caliber Mark 7 gun, had to be designed for them, as they could not accommodate the Mark 2 and Mark 3 guns. With war on the horizon, the Navy released the approximately 50 remaining guns, and on 27 July 1940 the Army's Harbor Defense Board recommended the construction of 27 16-inch two-gun batteries to protect strategic points along the US coastline, all to be casemated against air attack, as were almost all of the older 16-inch batteries by this time. A casemated 16-inch gun. Almost all batteries were casemated by 1940, including the M1919 gun batteries in New York and near Boston. Typical of this plan were the guns placed to protect Narragansett Bay; two 16-inch guns in Battery Gray, Fort Church, Little Compton, Rhode Island, with two more in Battery Hamilton, Fort Greene, Point Judith, Narragansett, Rhode Island. 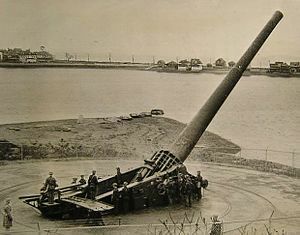 A second battery of 16-inch guns at Fort Greene, Battery 109, had construction suspended in 1943 and never received guns. These batteries were placed such that they not only protected Narraganset Bay, but interdicted the main channels into Buzzards Bay and the east end of Long Island Sound. By late 1943, the threat of a naval attack on the United States had diminished, and with two or four 16-inch guns in most harbor defenses, construction and arming of further batteries was suspended. As 16-inch guns and a companion improved 6-inch gun were emplaced, older weapons were scrapped. About 21 16-inch gun batteries were completed 1941-44, but not all of these were armed. With the war over in 1945, most of the remaining coast defense guns, including the recently emplaced 16-inch weapons, were scrapped by 1948. The gun fired a 2,340 lb (1,060 kg). projectile to a range of 26 miles (42 km). The estimated cost of the gun and barbette was $520,000 in 1938. The new M1 Gun Data Computer was used in directing these guns. ^ a b c "16-inch Gun Technical Data". Archived from the original on 2009-05-06. Retrieved 2007-06-23. ^ "Watervliet Arsenal Museum". Archived from the original on 2007-02-05. Retrieved 2007-06-23. ^ "16-Inch Coast Defense Gun". Archived from the original on 2007-09-28. Retrieved 2007-06-18. ^ a b c Schroder, Walter K. (1980). Defenses of Narragansett Bay in World War II. Rhode Island Bicentennial Foundation. pp. 37–50. ISBN 0-917012-22-4. Berhow, Mark A., Ed. (2015). American Seacoast Defenses, A Reference Guide, Third Edition. Mclean, VA: CDSG Press. ISBN 978-0-9748167-3-9. Friedman, Norman (1985). U.S. Battleships: An Illustrated Design History. Annapolis, Maryland: United States Naval Institute. ISBN 978-0-87021-715-9. Miller, H. W., LTC, USA (1921). Railway Artillery, Vols. I and II. Washington: US Government Printing Office. Ordnance Corps, US Army (1922). American Coast Artillery Materiel. Washington: Government Printing Office. Wikimedia Commons has media related to 16"/50 caliber M1919 gun. This page was last edited on 13 February 2019, at 07:33 (UTC).